Let’s go camping! 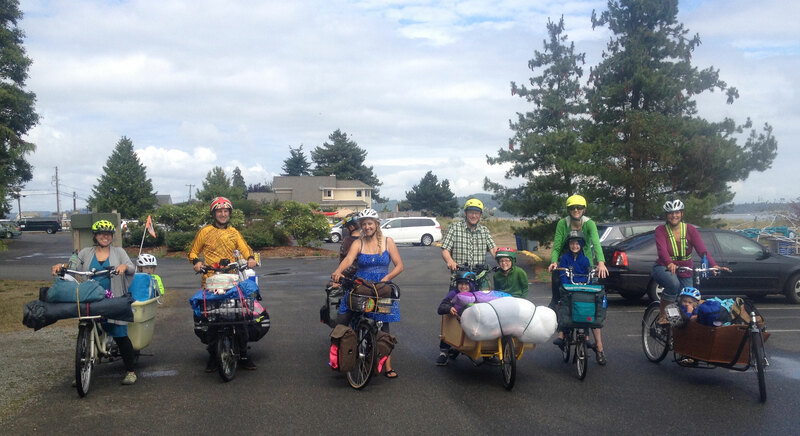 As part of Adventure Cycling Association’s 40th Anniversary National Bike Travel Weekend we’re doing a family bike overnight Saturday, June 4th through Sunday, June 5th at Fay Bainbridge Park. Our bike overnight is called “Tots in tents at Fay Bainbridge” (per the “be creative” suggestion about the event title, sorry). Facebookers can RSVP on the Facebook event page. 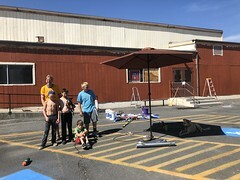 9:00 a.m. Saturday, June 4, 2016 – meet outside Fremont PCC Natural Market. 11:00 a.m. meet us at the ferry (inside, in line). 11:25 a.m. ferry sets sail (ARRIVE AT LEAST 20 MINUTES EARLY). If you have an Orca card, there is an automated tollbooth at the far right–no waiting behind the cars! But otherwise you need to wait in the rightmost car lane to pay. Current fares are $8.10 for adults, $4.05 for kids six and up, and $1 for bikes (sometimes big bikes cost extra, though I’ve never been charged extra for the cargo bike or tandem + trailer bike). The Bainbridge-to-Seattle direction is free. Once on Bainbridge Island, we’ll ride about a block uphill within the ferry terminal area to Bike Barn Rentals and hang out while the car traffic clears. Generally, we push directly onward to the campground, but there’s a grocery store in Winslow for any forgotten items. Hiker/biker camp spots are $7 per person, though sometimes the camp host is OK with us paying $7 per bike (essentially making kids free! ), so we always check in with the camp host first. Also, we’re often given permission to camp in the kayak-in area, which we’ll try to do again this year as we like that side best! Payment happens at a kiosk between the restrooms and the camp host. Here’s a recap of 2014’s summer family bike camping trip and Flickr gallery of our 2015 Swift Campout. Note: We’ve been doing group summer camping trips to Fay for several years now and usually don’t have kids riding their own bikes. This isn’t to say it’s not allowed, of course, but both the quiet scenic route of years past with its lack of shoulders or bike lanes and the highway we’ll take this year (and took last year) with its very wide shoulders but spots of 50mph traffic are not what I would consider exceptionally kid friendly. Bainbridge Island is very bikey with drivers used to seeing bikes on the roads, but it’s definitely busier (even the quiet, scenic route) and hillier (even the flat highway route) than my own Seattle kids are used to. At this point no concrete plans for when to head back Sunday. We’ll most likely have an early crowd and a later crowd. I’ll probably be part of the later crowd. The later group will head to Peddler Brewing Company for a Seattle-side hangout before going our separate ways. Our route from Fay to the ferry is a backtracking of our Saturday route over and here’s the route from the ferry terminal to Peddler. Don’t despair if this weekend doesn’t work! There will also be a trip for Swift Campout June 25-26 and I think our summer family bike camping trip will be July 30-31. Note: Social-media-inclined campers should use #adventurecycling #biketravelweekend #bikeovernights for this Bike Overnight for National Bike Travel Weekend. ← Our beloved G&O Family Cyclery was damaged in the Greenwood Explosion, please help! Sounds like fun! Alas, I’ll be a three speed bike campout that weekend down here in Portland!